What it’s about: Filling in an online “Otaku Quiz” is an odd way for your life to be turned upside-down, but that’s exactly what’s happened to Shinichi. It turns out that the Japanese government has made contact with another world, one filled with magical races and fantastical creatures. The ruler of this strange land has expressed an interest in learning about Japanese culture, and it’s down to Shinichi to act as a “cultural ambassador”, exporting anime, manga, and otaku culture to a new frontier. Why you should watch it: It’s a fairly light-hearted comedy mixed with a fantasy adventure. 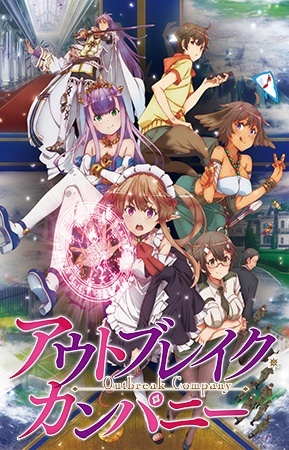 Outbreak Company is otaku culture poking fun at itself, with constant references to existing anime, manga, or media tropes. On top of the referential jokes and self-parody are a lot of slapstick and some relationship humour between Shinichi and the expanding cast of characters that he meets as part of his new job. And while there’s plenty to laugh at, the show actually does do a good job of conveying some deeper messages about cultural imperialism, discrimination, and commercialism. It also has a half-elf maid, animal-girls, and a tsundere princess. What’s not to love? Caveats: The show doesn’t make many mistakes, as such, but it never really tries to be *great*. While I had a lot of fun while watching it, I don’t really expect to remember all that much about the characters or plot a year from now. In short, it’s a fun but ultimately disposable show. Themes: It has a little to say about a lot of things. Commercialism, materialism, objectification, cultural imperialism, the negatives and positives of “otaku culture”. But at its core, it’s about spreading the ideas that you love and support to another person, while desperately hoping that they’ll like it too. Overall, the thematic development plays second or third fiddle to the comedy and fan-service elements of the show, which is just fine in a fun, light-hearted show like this. Similar works: No Game No Life. For a more serious take on “Modern Japan meets fantasy world”, Gate.